Therefore, the indications for old and new drugs need to be clarified and novel therapeutic strategies recommended on the basis of their availability, the patient profile, previous drug failure and benefit/risk ratio as well as the cost of the various drugs now available for the treatment of flare and for lowering urate levels. For this purpose, a task force was convened to update the 2006 EULAR recommendations for the management of gout, with the objective of addressing all overarching principles and individual recommendations by a SLR and expert and patient opinion. With the approval of the EULAR executive committee, the convenor (TB) along with two co-convenors of the 2006 task force (MD and EP), an epidemiologist (FT) and an academic rheumatologist (PR) formed a steering group to update the 2006 EULAR recommendations for the management of gout. The steering group prioritised the research questions, drafted the methodology to be used for these novel set of recommendations and assembled a task force. The first step was to determine whether the 12 former EULAR recommendations (2006) for the management of gout should be retained, modified or abandoned. For this purpose, members of the task force were sent a questionnaire and were asked to rate each recommendation by using a 9-point numerical rating scale (1, totally disagree; 9, fully agree). For each item, participants indicated whether they would keep the same recommendation (first question). If the answer was scored ≥5, the participants were then asked if they would modify the recommendation (second question). It was explained that the phrasing of the updated recommendations should not be a mere clinical statement—as for most of the 2006 EULAR recommendations—but wherever possible should take the form of a clear active recommendation specific to a particular clinical situation, as advised by the Appraisal of Guidelines for Research & Evaluation (AGREE II).20 The steering group had predetermined that an item from the 2006 recommendations would be deleted if all scores from the participants for the first question were <5 with a median ≤3.5. Conversely, the item would be unchanged if all scores for to the first question were ≥5 with a median ≥7 and when all scores for the second question were <5 with a median ≤3.5. If not, the items had to be modified. Members of the task force were also invited to indicate topics they would like to address for additional recommendations. Subsequently, one research fellow (JC-S) with the help of an expert in systematic review methodology (SG) performed an SLR by searching for literature published since 1 January 2005 in MEDLINE, EMBASE and Cochrane Library databases in June 2013. This process included both a general search and a proposition-specific search. The general search strategy consisted of two basic components: (1) gout in whatever possible terms in the databases and (2) types of study design in the forms of systematic review/meta-analysis, randomised controlled trial (RCT)/controlled trial, uncontrolled trial, cohort study, case–control study, cross-sectional study. The two components were combined to search for the current available research evidence on gout. The quality of evidence and grades of recommendation were determined according to the standards of the Oxford Centre for Evidence-Based Medicine.19 The quality of evidence was assessed by the GRADE method. Criteria for RCTs included adequate randomisation and allocation concealment, prognostic similarity between groups (in terms of the evaluated outcome), equal follow-up of groups, adequate blinding, validation of outcomes, application of intent-to-treat analysis, selective outcome reporting, stopping early for benefit, α-risk control with multiple comparisons or multiple outcomes. Criteria for observational studies included choice of controls, measurement of both exposures and outcomes, confounding factors, completeness of data, magnitude of effect and dose–response gradient. Criteria for meta-analysis included a priori-defined objectives and outcomes of interest, description of the literature search, selection criteria for included studies, assessment of quality of studies, evaluation of publication bias and homogeneity of results. In the next step, all task force members attended a 2-day meeting during which results of the SLR were presented in an aggregated form. The task force debated and evaluated the evidence presented and formulated a preliminary set of new recommendations. Then, the task force reached consensus regarding the proposed recommendations by using the Delphi sequential voting technique by email after the meeting. Subsequently, the level of agreement for each recommendation was graded. Each participant was asked to rate each recommendation again by using the 9-point numerical rating scale (1, totally disagree; 9, fully agree) and could propose a reformulation of the recommendation. Subsequently, this set of recommendations was externally evaluated by GPs (n=8) and rheumatologists (n=5) mainly in independent or private practice in Europe (the UK, The Netherlands, Spain, France, Portugal and Italy). Each physician was asked to rate each recommendation by using the abovementioned numerical rating scale. Finally, the task force set up a research agenda to discuss and develop 14 proposals. Finally, because the delay between the first SLR and the writing of the present manuscript was longer than expected, we conducted an additional SLR from June 2013 to May 2016. Results from this updated SLR can be found in the online supplementary material. The steering group discussed result of this SLR and agreed that it did not impact the overall content of the whole recommendations. Relevant references have been inserted in the body of the manuscript. The task force voted unanimously for a change in all items of the 2006 recommendations (see online supplementary material). Therefore, all the previous recommendations were amended to reflect newly available evidence from the SLR. In total, 984 references were retrieved form the literature search, among which 51 were analysed (see flow chart, online supplementary material). At the end of the 2-day meeting, a set of 14 preliminary new recommendations was produced and three Delphi rounds by email were needed to establish the final set of recommendations. Because too many recommendations might result in a loss of focus, the steering committee decided to move the first three recommendations under the umbrella of ‘overarching principles’, for a final set of 11 novel recommendations that focus more specifically on the treatment of flares and long-term management (tables 1 and 2). The external evaluation is provided as online supplementary material, and the research agenda appears in box 1. Investigating the ability of low-dose NSAIDs or prednisone to prevent ULT-induced flares. A head-to-head trial of anakinra versus a conventional anti-inflammatory agent for the treatment of flares. A controlled trial of early low-dose colchicine versus early NSAIDs or oral corticosteroids or potential new drugs for flares over 1 week. 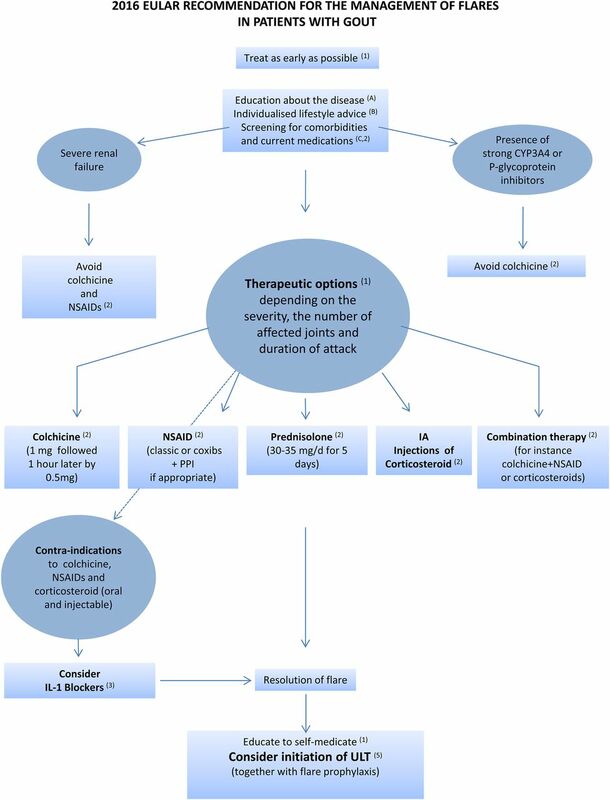 The optimal combined therapy for treatment of an acute attack. The optimal duration for prophylaxis of acute attacks when starting ULT. Risk factors for flares when initiating ULT. The long-term impact of very low urate levels on the central nervous system. The possible benefits of XO inhibition and/or lowering serum uric acid levels for cardiovascular diseases. The impact of ULT on kidney function. The best strategy in patients with tophaceous gout. Direct comparison (efficacy, side effects, cost utility) between emerging uricosurics and allopurinol or febuxostat. The cost-utility of HLA-B*58:01 determination before initiating allopurinol in patients not of Asian descent. Imaging to visualise crystal dissolution during ULT. More research should be conducted in primary care. NSAID, non-steroidal anti-inflammatory drug; ULT, urate-lowering therapy. Every person with gout should be fully informed about the pathophysiology of the disease, the existence of effective treatments, associated comorbidities and the principles of managing acute attacks and eliminating urate crystals through lifelong lowering of SUA below a target level. Every person with gout should receive advice regarding lifestyle: weight loss if appropriate and avoidance of alcohol (especially beer and spirits) and sugar-sweetened drinks, heavy meals and excessive intake of meat and seafood. Low-fat dairy products should be encouraged. Regular exercise should be advised. Importantly, other modifiable risk factors have been identified since 2006, specifically sugar-sweetened drinks, foods rich in fructose and orange or apple juice.38–41 In contrast, according to epidemiological studies, consumption of coffee,42–44 and cherries is negatively associated with gout, and eating cherries may reduce the frequency of acute gout flares.45 Studies found an inverse association between dairy intake and urate levels, particularly with skimmed milk and low-calorie yoghurt.34 ,46 This likely results from the uricosuric property of milk, as demonstrated in an RCT.47 The benefit of dairy products, underlined in the 2006 recommendation, was reported in a RCT, suggesting that skimmed milk powder derivatives have anti-inflammatory effects against acute gout flares.48 However, impact of lifestyle and dietary modification has little effect on urate concentrations.49 ,50 In addition, the task force recognises that the level of evidence to support the effect of lifestyle modification on SUA levels is low, and therefore, this overarching principle was mainly based on expert opinion. However, given the high prevalence of cardiovascular comorbidities in patients with gout, lifestyle modifications should also be implemented as part of cardiovascular prevention. Every person with gout should be systematically screened for associated comorbidities and cardiovascular risk factors, including renal impairment, coronary heart disease, heart failure, stroke, peripheral arterial disease, obesity, hyperlipidaemia, hypertension, diabetes and smoking, which should be addressed as an integral part of the management of gout. Acute flares of gout should be treated as early as possible. Fully informed patients should be educated to self-medicate at the first warning symptoms. The choice of drug(s) should be based on the presence of contraindications, the patient's previous experience with treatments, time of initiation after flare onset and the number and type of joint(s) involved. This recommendation was mainly based on expert opinion and derives from the first item of the 2006 recommendations. Because of the recognised high frequency of comorbidities and thus the high frequency of comedications in patients with gout, the task force felt that a global recommendation regarding the choice of drugs for flares based on the presence or absence of contraindications was highly desirable. This item emphasises the importance of searching for contraindications, often present in patients with gout. One study found that more than 90% of patients had at least one contraindication to non-steroidal anti-inflammatory drugs (NSAIDs) and that about one-third of patients who were prescribed colchicine had at least one major contraindication.64 This item also underlines the importance to treat as early as possible. Colchicine is effective when given within 12 hours of symptoms onset13 and there was general agreement that early initiation of any treatment for flare leads to better effectiveness. Therefore, the task force recommends the ‘pill in the pocket’ approach to treat flare in fully informed patients. Recommended first-line options for acute flare are colchicine (within 12 hours of flare onset) at a loading dose of 1 mg followed 1 hour later by 0.5 mg on day 1 and/or an NSAID (plus a proton pump inhibitor if appropriate), oral corticosteroids (30–35 mg/day of equivalent prednisolone for 3–5 days) or articular aspiration and injection of corticosteroids. Colchicine and NSAIDs should be avoided in patients with severe renal impairment. Colchicine should not be given to patients receiving strong P-glycoprotein and/or CYP3A4 inhibitors such as cyclosporin or clarithromycin. This item amalgamates the 2006 items 4–6, which have been amended in light of novel evidence. The main therapeutic options for flare are colchicine, NSAIDs and corticosteroids. The task force does not prioritise between these options because of no direct comparative evidence, but unlike 2006 item 4, it recommends considering combination therapy, such as colchicine and an NSAID or colchicine and corticosteroids, which can be proposed for patients with particularly severe acute gout (figure 1), for instance, when flares involve multiple joints. In comparison to 2006 items 4 and 5, more evidence is now available in terms of the effectiveness of colchicine,65 NSAIDs66–69 and oral corticosteroids.70–72 A double-blind, randomised equivalence trial of crystal-proven gout from a primary care source population found that prednisolone (35 mg/day for 5 days) was equivalent to naproxen (500 mg twice a day for 5 days) for treating flare.71 ,72 A recent trial also found that oral prednisolone (30 mg/day for 5 days) had analgesic effectiveness equivalent to that of indomethacin.70 The AGREE trial demonstrated that when taken within 12 hours of flare onset, self-administrated low-dose colchicine (1.8 mg) was as effective as high-dose colchicine (4.8 mg) but with a safety profile comparable to that of a placebo.65 In Europe, colchicine is available in 1 mg tablets, so the task force recommends the use of 1 mg colchicine followed 1 hour later by 0.5 mg for treating flare. A pharmacokinetic study73 showed that strong P-glycoprotein and/or CYP3A4 inhibitors such as cyclosporin, clarithromycin, verapamil and ketoconazole when prescribed with colchicine increased colchicine plasma concentration, thereby exposing patients to risk of serious side effects. The safe use of colchicine in patients with severe renal impairment (GFR <30 mL/min) has not been established. Because colchicine clearance is decreased in patients with severe renal impairment,74 ,75 the group considered that it should be avoided in these patients, because a reduced dosage73 might be a source of therapeutic misuse. In addition, it should be noted that colchicine is contraindicated in some countries in patients with severe renal failure. From data from two RCTs,71 ,72 the group also recommends the use of oral prednisolone at 30–35 mg for 5 days for treating flare. Finally, from data from an open trial76 ,77 and expert opinion, the group considered that intra-articular injection of corticosteroids, which has a good safety profile, should be considered particularly in patients with monoarthritis of an easily accessible joint, although acknowledging that this may not be practical in many primary care settings. In patients with frequent flares and contraindications to colchicine, NSAIDs and corticosteroids (oral and injectable), IL-1 blockers should be considered for treating flares. Current infection is a contraindication to the use of IL-1 blockers. ULT should be adjusted to achieve the uricaemia target following IL-1 blocker treatment for flare. Management of acute flare according to the European League Against Rheumatism recommendations. Letters and numbers in parentheses indicate the items of the recommendations presented in table 1. Strong P-glycoprotein or CYP3A4 inhibitors are cyclosporin, clarithromycin, ketoconazole and ritonavir. IL, interleukin; NSAID, non-steroidal anti-inflammatory drug; PPI, proton pump inhibitor; ULT, urate-lowering therapy. Since the last 2006 recommendations, IL-1β was found to play a crucial role in monosodium urate (MSU) crystal-induced inflammation.78 Two RCTs have reported that the anti-IL-1β monoclonal antibody canakinumab (150 mg subcutaneously, one dose) was superior to triamcinolone acetonide (40 mg subcutaneously, one dose) in reducing pain in patients with flare with contraindication, intolerance of or non-response to NSAIDs and/or colchicine.79 These findings led to approval of the drug in Europe solely in patients with contraindication to colchicine, NSAIDs and steroids. Despite the lack of RCTs of anakinra, a case series also suggest that this IL-1 receptor antagonist, administered subcutaneously at 100 mg for 3 days, could be effective in reducing pain in patients with acute attacks.80–83 By contrast, an RCT demonstrated that one subcutaneous injection of rilonacept, 320 mg, a soluble receptor fusion protein binding both IL-1α and IL-1β,84 provided no benefit over indomethacin (oral, 50 mg, three times a day for 3 days).85 Because of the risk of sepsis in patients receiving IL-1 blockers,86 the task force considered current infection a contraindication to the use of anti-IL-1 biologics, which implies screening for occult infections. Finally, in accordance with the European Medicines Agency labelling of canakinumab, the group stressed the need to effectively lower SUA level in these patients with severe gout once the flare resolved following IL-1β blockade. Prophylaxis against flares should be fully explained and discussed with the patient. Prophylaxis is recommended during the first 6 months of ULT. Recommended prophylactic treatment is colchicine, 0.5–1 mg/day, a dose that should be reduced in patients with renal impairment. In cases of renal impairment or statin treatment, patients and physicians should be aware of potential neurotoxicity and/or muscular toxicity with prophylactic colchicine. Co-prescription of colchicine with strong P-glycoprotein and/or CYP3A4 inhibitors should be avoided. If colchicine is not tolerated or is contraindicated, prophylaxis with NSAIDs at a low dosage, if not contraindicated, should be considered. Dispersion of MSU crystals during the initial phase of deposit dissolution may expose the patient to increased rate of acute flare that can contribute to poor treatment adherence.87 The 2006 recommendations (item 11) mentioned that prophylactic treatment should be given during the first months of ULT. Since then, data from pivotal trials of febuxostat versus a fixed dose of allopurinol (300 mg) found that flare prophylaxis with low-dose colchicine (colchicine, 0.6 mg/day) or low-dose NSAID (naproxen, 250 mg twice daily) for up to 6 months appeared to provide greater benefit than flare prophylaxis for 8 weeks, with no increase in adverse events.88 However, the task force felt that initiation of prophylaxis should be discussed with every patient. Indeed, a study found that following patient education and with slow upward titration of ULT, mostly allopurinol, many patients chose not to take prophylaxis and did not experience a significantly greater flare rate.28 This recommendation also explicitly underlines the need to search for renal impairment before prescribing colchicine75 and co-prescription with statins89 and P-glycoprotein and/or CYP3A4 inhibitors73 to avoid serious side effects. Of note, two RCTs found that low-dose colchicine in patients with a history of coronary heart disease could reduce the incidence of major cardiovascular events.90 ,91 Reports for several trials described the efficacy of canakinumab and rilonacept,92–96 two IL-1 inhibitors, for preventing flares during the initiation of allopurinol therapy. However, none of them has been approved for prophylactic treatment. ULT should be considered and discussed with every patient with a definite diagnosis of gout from the first presentation. ULT is indicated in all patients with recurrent flare (≥2/year), tophi, urate arthropathy and/or renal stones. Initiation of ULT is recommended close to the time of first diagnosis in patients presenting at a young age (<40 years), or with a very high SUA level (>8 mg/dL; 480 µmol/L) and/or comorbidities (renal impairment, hypertension, ischaemic heart disease, heart failure). Patients with gout should receive full information and be fully involved in decision-making concerning the use of ULT. Several studies concur in showing that gout is a risk factor for mortality, in particular from cardiovascular causes,17 ,107 ,108 and a risk factor for kidney impairment51 as discussed previously (see the third overarching principle). Item 5 also underlines the need to start ULT early, particularly in patients with comorbidities and/or SUA level >8 mg/dL. Encouragement to treat patients with high SUA level earlier is based on studies showing an association of high uricaemia with increased flare frequency.125–127 Similarly, early treatment in patients with comorbidities is supported by a study of a large cohort of gout patients finding hypertension, ischaemic heart disease and CKD all associated with increased risk of recurrence of flare.128 Young age at gout onset is also a marker of gout severity129 and should also prompt earlier treatment. This recommendation underlines again the importance of providing full information and involving the patient in the decision-making process, to ensure adherence to ULT and optimal patient-centred outcomes. Finally, the task force did not give specific guidance on whether urate-lowering drugs should be initiated during a flare or whether a traditional 2 weeks delay from flare termination should be observed. Two small trials have suggested that allopurinol initiation during an acute gout attack did not prolong the duration of flares nor worsen its severity as compared with delayed initiation.130 ,131 However, the task force considered that the low number of patients (n=51 and n=31, respectively) in these trials precluded any firm conclusions and that data obtained with allopurinol 200–300 mg could not be generalised to more potent urate-lowering drugs, such as febuxostat or a combination of XOI and an uricosuric. For patients on ULT, SUA level should be monitored and maintained to <6 mg/dL (360 µmol/L). A lower SUA target (<5 mg/dL; 300 µmol/L) to facilitate faster dissolution of crystals is recommended for patients with severe gout (tophi, chronic arthropathy, frequent attacks) until total crystal dissolution and resolution of gout. SUA level <3 mg/dL is not recommended in the long term. As in 2006 (item 8), the task force recommends a treat-to-target strategy for every patient with gout, to maintain the SUA level <6 mg/dL, which is below the saturation point for MSU132 to dissolve all crystal deposits.133 Because the velocity of crystal dissolution depends on the SUA level,134 ,135 the task force also recommends reducing the SUA level to <5 mg/dL for severe gout reflecting high crystal load until total crystal dissolution has occurred. The task force also agreed that once dissolution of crystals is achieved, SUA level could be maintained <6 mg/dL by a reduction in the dose of ULT to avoid new formation of urate crystals. Some studies, but not all,136–138 have suggested that uric acid might protect against various neurodegenerative diseases such as Parkinson's disease, Alzheimer's disease or amyotrophic lateral sclerosis.139–142 Given these data and the availability of ULT that has the potency to greatly decrease SUA levels, the task force does not recommend lowering continuously the SUA level to <3 mg/dL in the long term that is, for several years. All ULTs should be started at a low dose and then titrated upward until the SUA target is reached. SUA <6 mg/dL (360 µmol/L) should be maintained lifelong. The task force recommends upward titration of ULT in every patient when feasible. This approach, mentioned in 2006 (item 9), might result in fewer episodes of acute flares during treatment initiation28 and therefore improved adherence to ULT, which is low according to several studies.27 ,143 ,144 Following complete dissolution of MSU crystals, the SUA level should be maintained at <6 mg/dL lifelong. Indeed, a study showed that about 40% of successfully treated patients show recurrence of flare 5 years after withdrawal of ULT.145 Therefore, determining SUA level on a regular basis is a key aspect of treatment. In patients with normal kidney function, allopurinol is recommended for first-line ULT, starting at a low dose (100 mg/day) and increasing by 100 mg increments every 2–4 weeks if required, to reach the uricaemic target. If the SUA target cannot be reached by an appropriate dose of allopurinol, allopurinol should be switched to febuxostat or a uricosuric, or combined with a uricosuric. Febuxostat or a uricosuric are also indicated if allopurinol cannot be tolerated. Febuxostat is a potent non-purine selective XOI approved at daily doses of 80 and 120 mg in Europe. It is metabolised in the liver and renal excretion is not a major route of elimination, which allows for its use in patients with mild-to-moderate kidney failure. A short-term phase II trial151 and three large RCTs (see online supplementary material) showed superior urate-lowering efficacy with febuxostat (80 or 120 mg) as compared with the commonly used fixed daily dose of 300 mg allopurinol.97 ,98 ,149 Cutaneous reactions have been described in pivotal trials with febuxostat.97 ,149 Despite case reports of SCARs in patients receiving febuxostat,152 ,153 recent data do not support any cross-reactivity between the two drugs.153 ,154 Therefore, the task force considered that a history of allergic reaction to allopurinol was not a contraindication to febuxostat, but underlined the need to carefully follow these patients. In patients with renal impairment, the allopurinol maximum dosage should be adjusted to creatinine clearance. If the SUA target cannot be achieved at this dose, the patient should be switched to febuxostat or given benzbromarone with or without allopurinol, except in patients with eGFR <30 mL/min. Renal failure has been associated with an increased risk of SCARs and poor outcome.163 ,164 Decreased renal function results in decreased clearance and higher serum levels of oxypurinol,164 ,166 which could induce a cytotoxic T-cell response and trigger hypersensitivity reactions in SCARs.167 In some studies, dose escalation of allopurinol above the limit allowed by creatinine clearance did not result in SCARs,14 ,168 but given the very low incidence of SCARs and the limited number of patients involved in these studies, the task force considered that they probably lacked power to detect a potential association. Therefore, given the extreme severity of SCARs and the possibility of therapeutic alternatives such as febuxostat, the task force retained the conservative approach to adjust the maximum dose of allopurinol to the creatinine clearance169 in patients with renal impairment, as required by most regulatory agencies. Because the dose recommendations in renal disease may slightly differ across countries, the task force recommends to follow the local Summary of Product Characteristics. Febuxostat has been found more effective in patients with CKD than allopurinol given at doses adjusted to creatinine clearance149 ,170 and therefore can be used in these patients. Finally, benzbromarone is not recommended for use in patients with eGFR <30 mL/min, but can be used in patients with moderate renal impairment171 ,172 because it is predominately metabolised by the liver. In patients with crystal-proven severe debilitating chronic tophaceous gout and poor quality of life, in whom the SUA target cannot be reached with any other available drug at the maximal dosage (including combinations), pegloticase is indicated. Since the last EULAR recommendation, pegloticase has emerged as a powerful ULT for refractory gout. Pegloticase is a pegylated uricase, produced by a genetically modified strain of Escherichia coli that catalyses the oxidation of uric acid into allantoin, a more soluble end product.173 Its efficacy has been assessed in two replicate 6-month, randomised, double-blind, placebo-controlled, phase III trials.99 ,100 In this study, the percentage of responders (SUA level <6 mg/dL) was 42%, on average, in patients who received pegloticase, 8 mg, every 2 weeks and 0% in the placebo group. Allergic reactions, possibly related to the occurrence of antibody against pegloticase,174 were observed in about 25% of patients who received pegloticase biweekly. Given the safety profile of pegloticase and the demonstration of its efficacy in patients with refractory gout, the task force recommends its use in patients with clinically severe crystal-proven gout that cannot be properly treated with conventional ULT, including a combination of an XOI and a uricosuric agent. There was no firm agreement with regards to the duration of treatment with pegloticase. However, there was a consensus to consider a switch, if feasible, toward an oral ULT once all tophi had disappeared. When gout occurs in a patient receiving loop or thiazide diuretics, substitute the diuretic if possible; for hypertension, consider losartan or calcium channel blockers; for hyperlipidaemia, consider a statin or fenofibrate. These updated EULAR recommendations aim to provide physicians—rheumatologists, GPs and others—with the best pragmatic strategies to manage hyperuricaemia and flare in patients with gout (figures 1 and 2). Management of hyperuricaemia in patients with gout according to the European League Against Rheumatism recommendations. Letters and numbers in parentheses refer to the items of the recommendations presented in table 1. SUA, serum uric acid; ULT, urate-lowering therapy; XOI, xanthine oxidase inhibitor. ¶At this stage, combined allopurinol and a uricosuric is also recommended. As first-line care providers, GPs have a predominant role in gout treatment. Likewise, the involvement of patients in the management of chronic diseases is crucial. Therefore, in contrast to 2006, the current task force included two GPs and two patients to broaden the involvement of stakeholders involved in the disease. As mentioned previously, gout is mainly managed by GPs, and the task force recognises that we lack trials conducted in primary care; most of the RCTs analysed in this paper were conducted in tertiary care. Overall, this set of recommendations was well graded by external GPs and rheumatologists (see online supplementary material). Since 2006, the perception of gout has changed. The increase in prevalence of gout in developed countries,1–3 ,180 the severity of the arthritis itself,6 and the increasing evidence for an association between gout with cardiovascular events, kidney failure and mortality have heightened the realisation that gout should never be neglected and should be treated properly.6 Furthermore, since 2006, the treatment armamentarium has greatly expanded, with the approval of both febuxostat and pegloticase, the demonstration of the efficacy of IL-1 blockers to treat flare and the emergence of novel ULTs.11 ,12 ,181 As expected, the task force modified all the previous 2006 recommendation items to incorporate all these recent developments and altered perspectives that have resulted from recent research evidence. As compared with 2006, the key differences in terms of the therapeutic strategy for the management of hyperuricaemia are the recommendations to titrate and initiate ULT very early in the course of the disease, to combine an XOI and a uricosuric, and for patients with severe gout to reach a target SUA level of 5 mg/dL (300 µmol/L) to hasten crystal dissolution. The task force was convinced that treatment of hyperuricaemia should be target-oriented and initiated without delay to avoid a further longstanding period of silent urate deposits.182–184 In addition, a ‘start low, go slow’ approach is recommended, because it probably results in fewer episodes of acute gout during treatment initiation and therefore might improve ULT adherence. These revised EULAR recommendations differ in some aspects from the 2012 American College of Rheumatology (ACR) guidelines.185 ,186 For instance, ACR recommends allopurinol or febuxostat as first-line therapy, whereas EULAR recommends allopurinol first and then febuxostat with failure to achieve the predetermined SUA target. As indicated previously, this recommendation was not supported by efficacy data, but rather took into account the cost and effectiveness of both drugs at their optimal dosage as well as regulatory rules endorsed in several European countries. Importantly, unlike the ACR, the EULAR recommends adjusting the dosage of allopurinol to the creatinine clearance in patients with renal failure, owing to an increased risk of SCARs in those patients,164 and febuxostat as an alternative if the SUA target is not reached. The ACR also recommended that ULT could be started during an acute attack185 if anti-inflammatory treatment had been introduced, a strategy not recommended in the present paper. These recommendations also did not mention systematic HLA-B*5801 screening before the initiation of allopurinol. This haplotype is the strongest risk factor for allopurinol-induced SCARs,187 and oxypurinol, the serum levels of which are increased in patients with renal failure,164 can preferentially bind to the peptide binding groove of HLA-B*58:01 and dose-dependently activate T cells.188 ,189 The association between carriage of this allele and increased risk of SCARs has been mainly observed in certain ethnic populations, including Han Chinese, Thai and Korean patients, showing high allele frequency.187 By contrast, in Europe, where the allele frequency is much lower, allopurinol-induced SCARs have been reported also in the absence of this haplotype.190 Although studies conducted in Asia found that screening for HLA-B*58:01 was cost-effective191 ,192 and reduced the incidence of allopurinol-induced SCARs,159 the task force felt that we lack sufficient data to provide firm recommendations for cost-effective screening in populations with low allele frequency, such as Europe. Therefore, screening for this haplotype before initiating allopurinol is left to the discretion of the attending physician, who should however be aware of the genetic risk of severe allergic reaction conferred by HLA-B*58.01 carriage. Recommendations for the treatment of flares have also markedly evolved since 2006 in that use of colchicine should be tailored according to current medications and comorbidities, oral corticosteroids can be offered and a combination of anti-inflammatory agents is now recommended depending on the severity of flares. Items related to colchicine, NSAIDs and oral corticosteroids are now predominantly evidence-based, whereas those related to combined therapy and intra-articular corticosteroid injections rely on expert and patient opinion, which highlights the need for further trials. The other main novelty for treatment of flares is the recommendation for IL-1 blockade in patients with frequent, poorly controlled flares. Given the price and putative infection risk associated with IL-1 blockers, the task force recommends their use in patients with contraindications to colchicine, NSAIDs and corticosteroids. Finally, the need to educate patients and to promote a ‘pill-in-the-pocket’ approach is highlighted to provide rapid treatment of flares, because the task force is convinced that patients must play a key role and be fully involved in the management of their disease. These novel EULAR recommendations will undoubtedly require updating over the next few years. Indeed, we anticipate that new data on existing drugs or emerging drugs, in particular novel uricosurics, will be available soon. In addition, studies of therapeutic strategies are likely to emerge. The task force sincerely hopes that these pragmatic recommendations will improve the current quality of gout care. This paper is dedicated to the memory of Dr Victoria Barskova. We are grateful to the external GPs and rheumatologists who read and/or rated these recommendations: Burchert-Mainz@t-online.de; a.hagenow@ansb.de; Uta.Kiltz@elisabethgruppe.de; graham@davenport1.plus.com; emwise@doctors.org.uk; philip.courtney@nuh.nhs.uk; m.kloppenborg@wxs.nl; wendyvantuijl@kpnmail.nl; mjanssen@rijnstate.nl; bohumil.seifert@svl.cz; ondrej.viklicky@ikem.cz; marianpou@gmail.com; cesardiaztorne@gmail.com; anarita.rferreira@gmail.com; eunicecarrapico@gmail.com; inescrispin@hotmail.com; jacques.malghem@uclouvain.be; franz.kainberger@billrothhaus.at; marco.zanetti@hirslanden.ch; danielguntern@hotmail.com; e.roddy@keele.ac.uk; Tove.Borgen@diakonsyk.no; hbham@online.no; LarsFridtjof.Karoliussen@diakonsyk.no; gerard.chales@chu-rennes.fr; docteur.aubert@gmail.com; gilleserrieau@yahoo.fr.
. 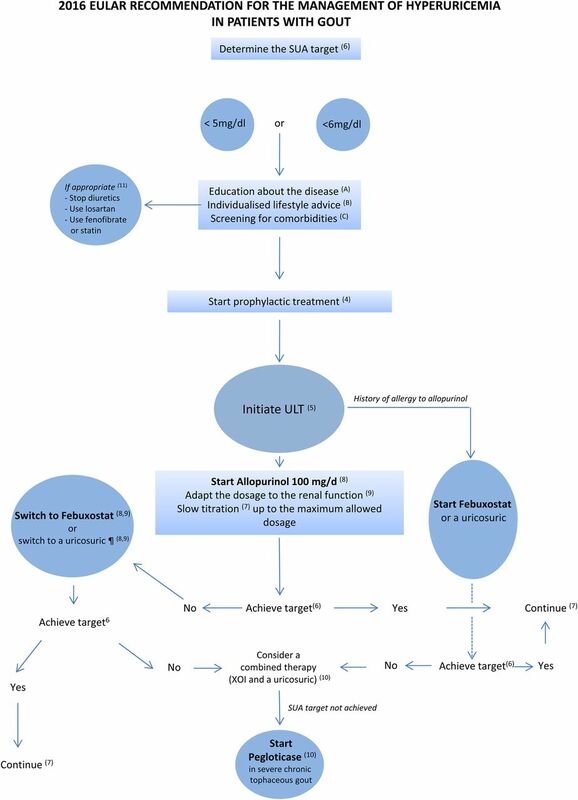 Eligibility for and prescription of urate-lowering treatment in patients with incident gout in England. JAMA 2015;312:2684–6.
. Effects of diet, physical activity and performance, and body weight on incident gout in ostensibly healthy, vigorously active men. Am J Clin Nutr 2008;87:1480–7.
. Etoricoxib versus indomethacin in the treatment of Chinese patients with acute gouty arthritis: a randomized double-blind trial. Chin Med J 2013;126:1867–71.
. Treatment of acute attacks of gout with a small dose of intraarticular triamcinolone acetonide. J Rheumatol 1999;26:2285–6.
. Use of HLA-B*58:01 genotyping to prevent allopurinol induced severe cutaneous adverse reactions in Taiwan: national prospective cohort study. BMJ 2015;351:h4848.
. Dose adjustment of allopurinol according to creatinine clearance does not provide adequate control of hyperuricemia in patients with gout. J Rheumatol 2006;33:1646–50. Competing interests PR received fees from Ipsen Pharma/Menarini, AstraZeneca and Savient. MD has received honoraria for ad hoc advisory boards on gout or osteoarthritis from Ardea BioSciences, AstraZeneca, Nordic BioSciences and Roche and CI for a Nottingham University Investigator-led non-drug study on gout funded by AstraZeneca. EP received fees from Ipsen Pharma/Menarini and AstraZeneca. TLJ received fees for lectures and/or advisory boards from AstraZeneca, AbbVie, BMS, Janssen, Eli Lilly, Menarini, Novartis, Pfizer, Roche, UCB. FL received fees for advisory boards: Ardea BioSciences, AstraZeneca global, AstraZeneca France, Ipsen Pharma, Menarini International, Menarini France, Novartis France, Novartis Global, Savient, Mayoly Spindler. He also had unrestricted grants for organising the European Crystal Workshops (Convenor Frédéric Lioté, France & Alexander SO, Switzerland) since 2010: Ardea BioSciences, AstraZeneca global, AstraZeneca France, Ipsen Pharma, Novartis France, Novartis Global, Mayoly Spindler, Savient, SOBI France, SOBI International. He received fees for lectures from Ardea BioSciences, Ipsen Pharma, Menarini France, Novartis Global. GN received fees from Savient, Ipsen and Menarini. FP-R has received fees from Ipsen Pharma, Menarini and AstraZeneca. LP has received consulting or speaker fees from Menarini, Fidia, AbbVie, Merck. AS has served as consultant to AstraZeneca and SOBI in regards to the treatment of gout. AKT received fees from Berlin Chemie-Menarini, Novartis and AstraZeneca/Ardea BioSciences. TU received fees from Novartis and AstraZeneca/Ardea. JZ received fees from Berlin Chemie-Menarini and Novartis, both <US$1000. WZ received honorarium from Savient as part of the Advisory Board for Pegloticase. TB has received consulting fees, speaker fees or grants from Ipsen Pharma, Menarini, AstraZeneca, Novartis, SOBI, Savient and CymaBay.